In this window you possible can check players for very simple bots. This feature some times can help gms checking stacks of players. First column name contains player nicks. 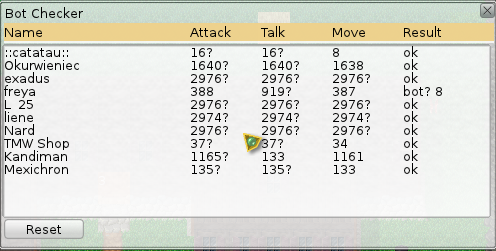 Columns attack, talk, move contains time in seconds after last player action. If it also contain ? sign, this mean action time unknown, and this number counted from first player seen time. Columns result contains checking result. If it show ok, then bot checker not detected bot. If it show bot with out or two question marks, this mean some parameters possible like bot. If it show bot! !, this mean detector count player like bot. Warning: this bot detector cant detect real bots, and you can use it as helping service for detecting bots only.